The Arctic is a special place. If you spend a lot of time looking at photos and watching television shows, you’ll quickly get the impression that it’s so full of life that close-up wildlife encounters are the norm. The reality, however, is a bit more complicated. 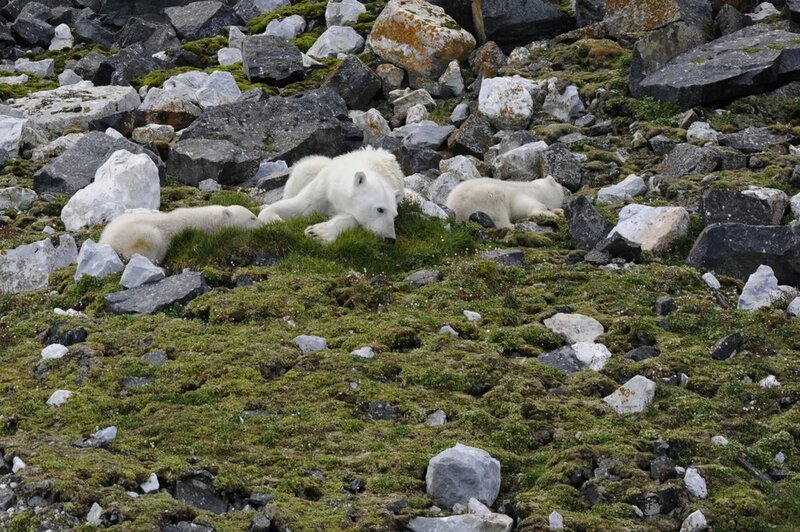 Arctic wildlife is almost universally hunted, and thus animals are understandably wary of human presence. Spotting wildlife takes a careful naturalist’s eye and requires days spent scanning the tundra through spotting scopes and binoculars — and that’s just to find it! Enjoy some of these photos from the latest trip, along with some of the stories and insights that go along with them. 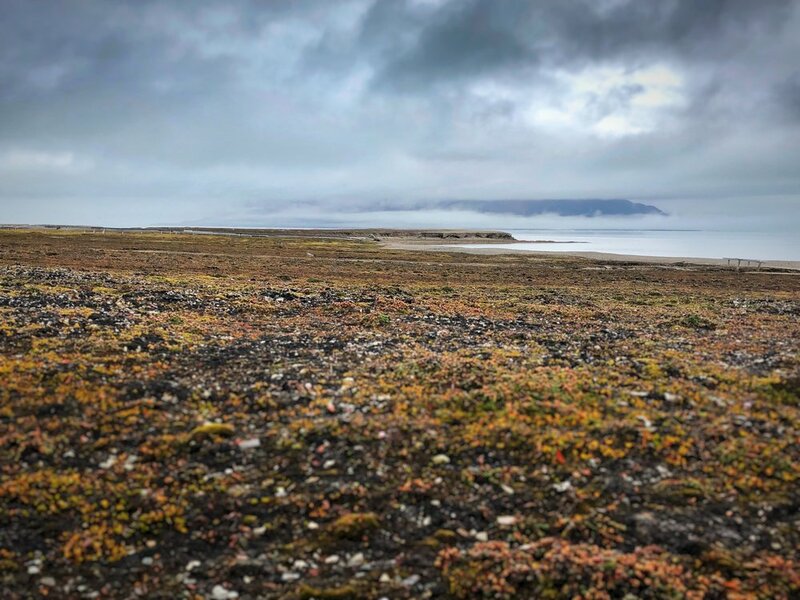 Wide open tundra, like a miniature forest, sprawls on for miles. We encountered this (Erignathus barbatus) hauled out on an ice floe while scouting out potential landing sites in Palanderbukta, Svalbard. It’s not uncommon to see seals skulking around near the tidewater faces of large glaciers, as frequent calving events can shock and stun their marine prey. 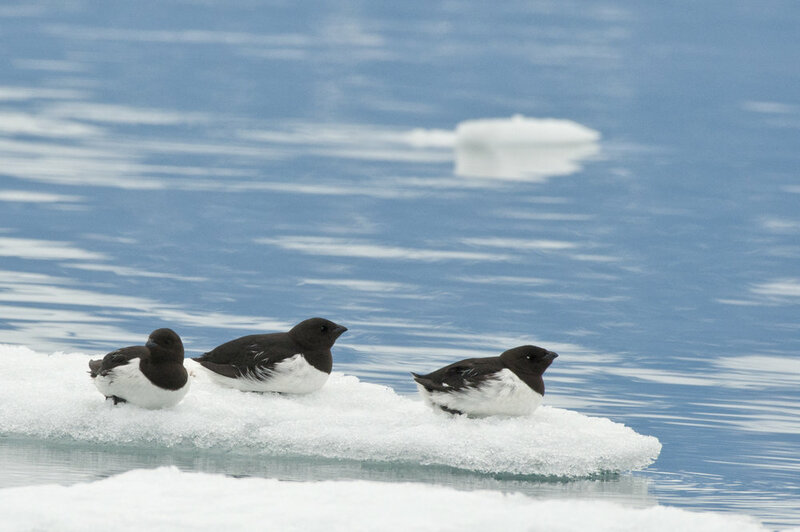 It’s not easy to get close to these tiny birds, which nest colonially throughout Greenland. Dovekie are particularly abundant near the edges of large ice floes, where they pursue plankton and other dense patches of marine prey underwater. 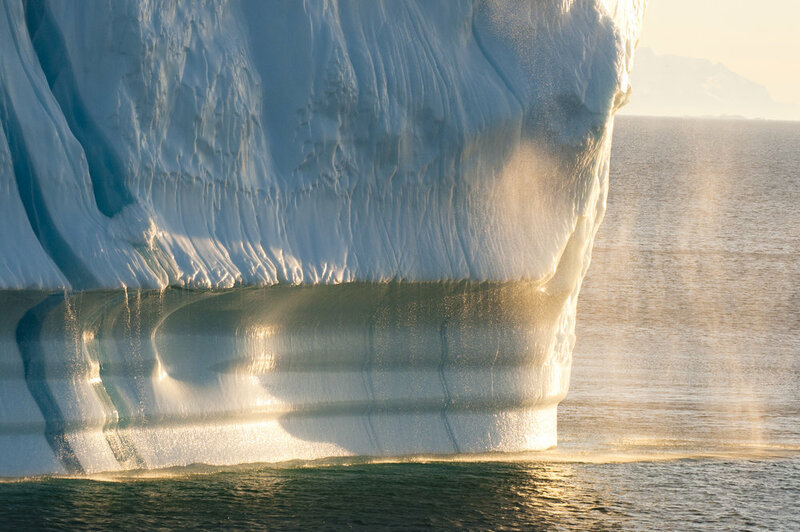 Sun refracts off the cascading melt stream of an iceberg in Scoresby Sund, East Greenland. Jaegers (and their close relatives, the skuas) never fail to excite me. 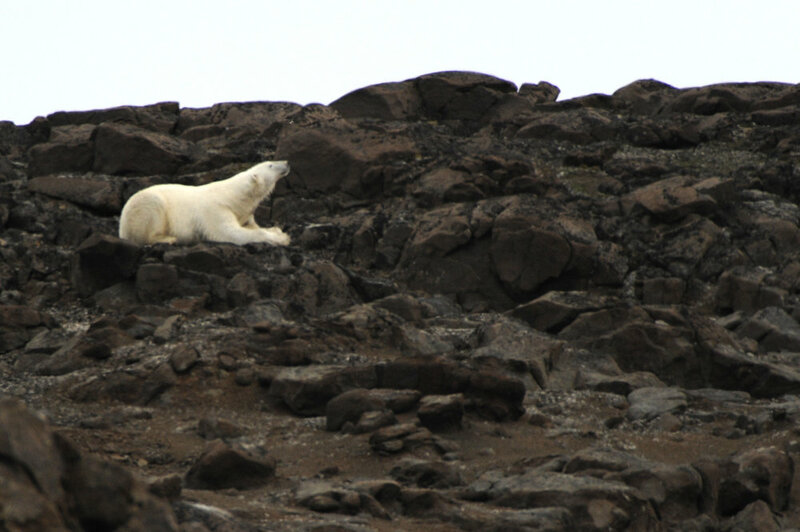 A polar bear takes a break from hunting seals to investigate the zodiac. The scars on his face and nose hint at some run-ins with other males. Uncertain but holding his ground. Polar bears have a natural curiosity that often leads to lapses in judgement — the scars on this male indicate he’s no stranger to conflict. We kept a very generous distance. A walrus cow keeps a close eye on her curious calf. Despite a growing tourism industry in Svalbard, walrus still associate humans with danger and will take flight at a moments notice. A zodiac cruise along the tortured-looking glacier face at Wahlenbergfjord provides ample opportunities to marvel at the diversity of ice. 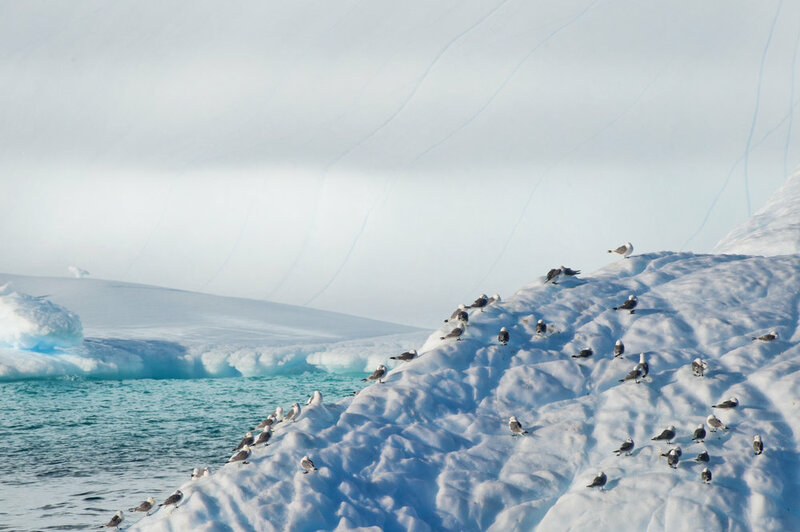 The subtle color palette of Svalbard is a treat to behold regardless of the wildlife you encounter. This mother and her two cubs were encountered while they browsed on grass — yes, grass! — near one of the most impressive seabird nesting cliffs in the archipelago. In a week’s time, seabird fledglings will leap from the ledges and crevices on which they hatched, taking their first flights. It’s a good time to be a hungry bear below these cliffs — many chicks will struggle to make it to the open ocean, and this mother bear will have the chance to feed her own offspring. We encountered this bear scrounging around the barren coasts of Bjorn Øya. Clearly hungry, he made a few passes at the local tern colony before taking a rest. It’s difficult to go a day in the arctic without seeing droves of fulmar, one of the far north’s champion ocean travelers. Fulmar range across the entire Arctic Ocean, coming ashore on offshore islands only to breed. A typical view of the arctic’s diminutive flora. At the northernmost stretches of Scoresby Sund lies the small hunting lodge of Sydkap. 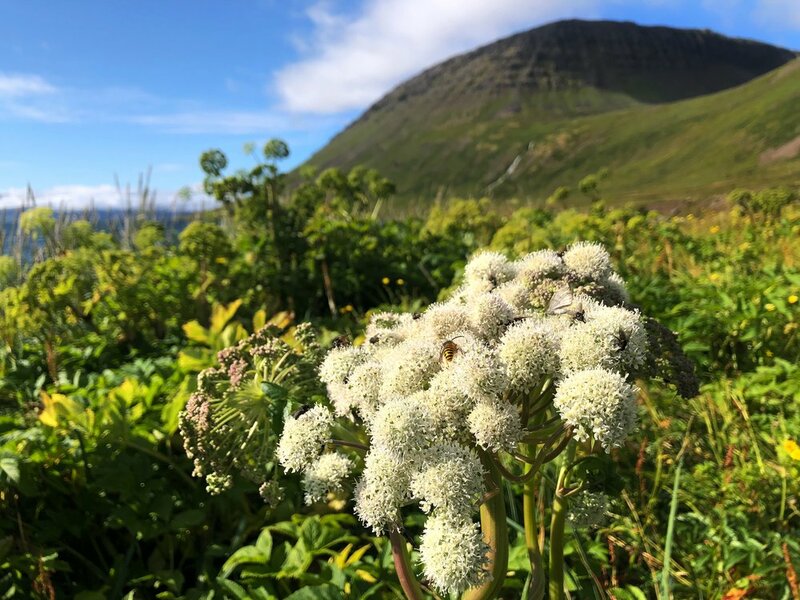 Wildflowers and dense carpets of ground-cover plants make this place a colorful respite from the monochromatic icy straits found elsewhere in the region. 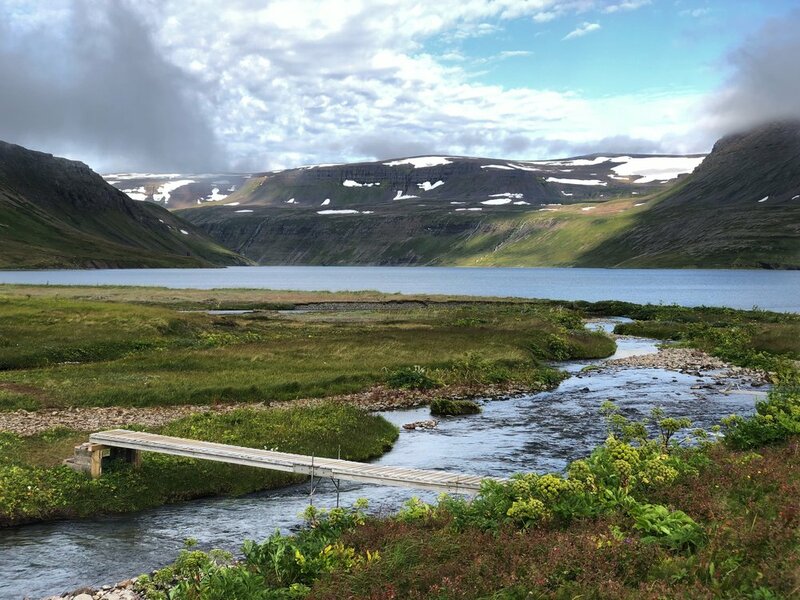 Melt streams from snowfields and glaciers persist late into the summer, becoming the arteries of nutrient flow across the arctic tundra. A group of black-legged kittiwake (Rissa tridactyla) waits for a calving atop an iceberg in Scoresby Sund, Greenland. Calving events send underwater shockwaves that can stun small fish and crustaceans, making them easy pickings for seabirds such as the kittiwake. We spotted this polar bear between bouts of dense fog, deep within the pack ice. After waiting still for almost exactly an hour, she tentatively came our way just close enough to provide some beautiful looks through the scope. 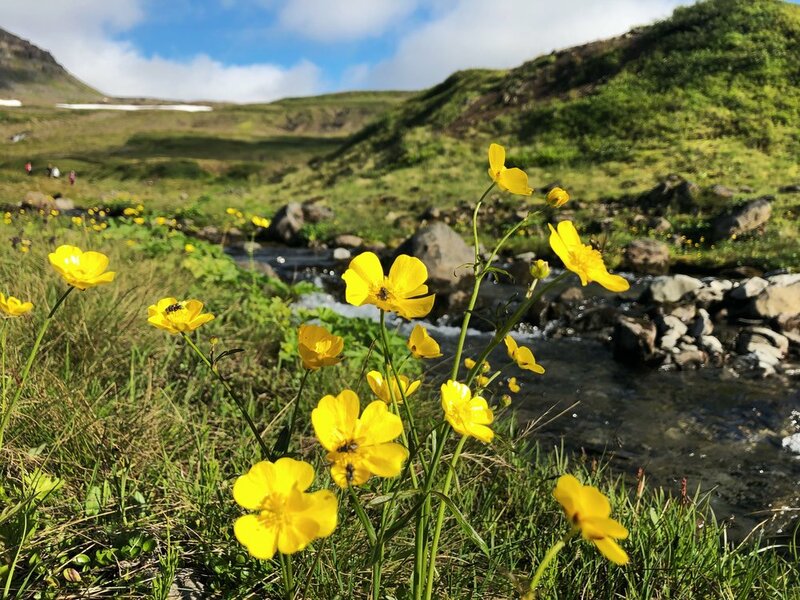 Small insects gather in the parabolic discs of these arctic buttercup, where they can keep warm and out of the wind.